I spent Saturday morning making yummy things in my kitchen. I adore strawberries, so I stocked up on them over the summer, freezing them for a winter smoothie or some other concoction. 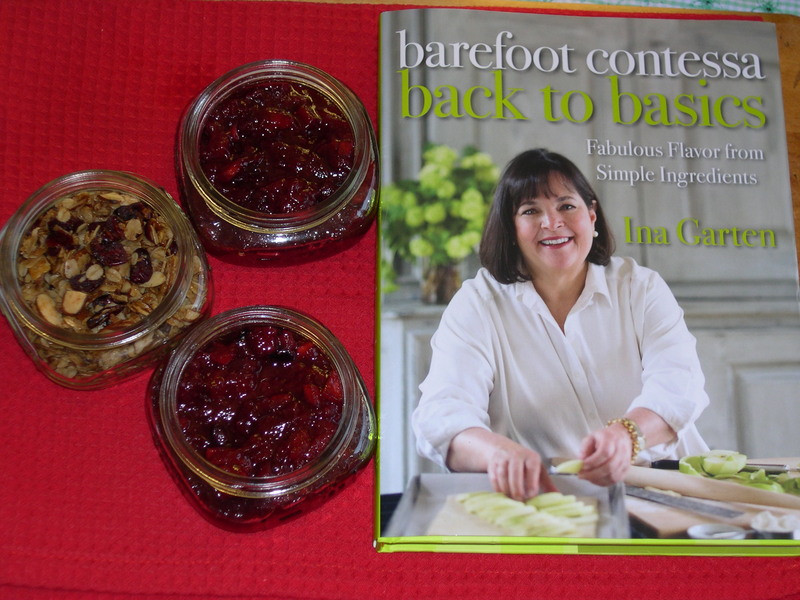 I decided to make this strawberry jam adapted from a recipe in Barefoot Contessa’s new Back to Basics cookbook, which I got for Christmas. Rinse strawberries. Drain & hull. Cut large ones in half. Place in kettle & toss with sugar and liqueur. Bring to boil, stirring. Add apple & blueberries and continue boiling until mixture reaches 220 degrees with candy thermometer, about 25-30 minutes. 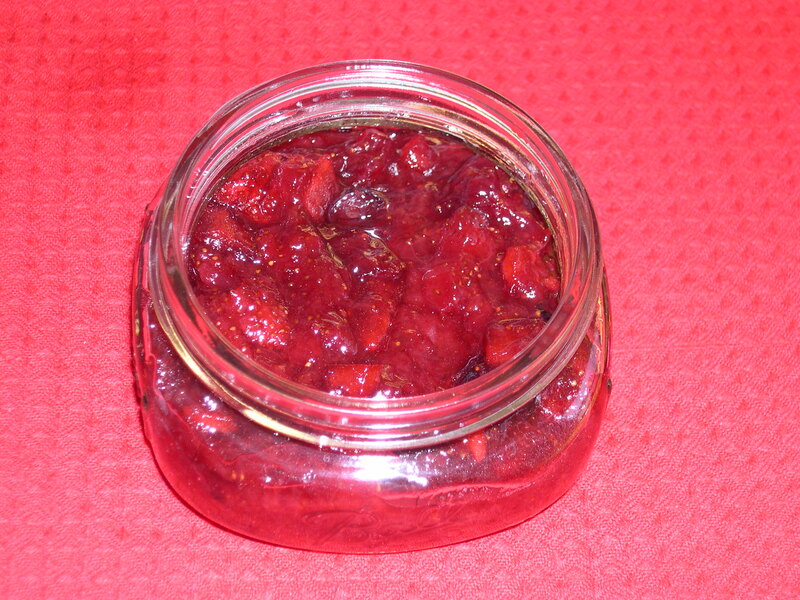 Allow to cool and store in the refrigerator for up to 2 weeks or in canning jars for longer term storage. I changed a couple things in that recipe. I only had 1-1/2 pints of strawberries in the freezer, so I reduced the amount of sugar. I didn’t have the liqueur so I used brandy instead, which believe it or not, turned out quite tasty. 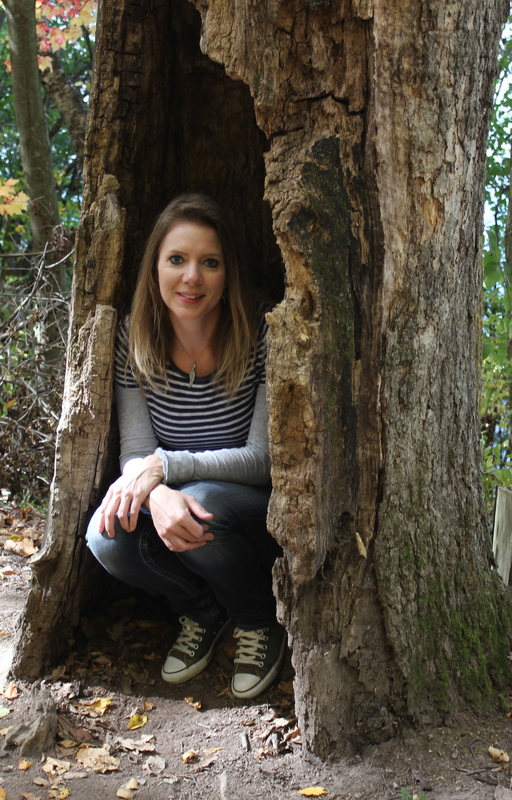 I also used the entire apple because I didn’t read the directions closely – turned out just fine. I have been wanting to make granola for awhile too, since my stash of my favorite organic granola from the last outdoor farmers market in November is gone now. Reheat oven to 350 degrees F.
Toss the oats, coconut, almonds and cherries together in a large bowl. Pour the vegetable oil and honey over the oat mixture. Add the cinnamon, and stir with a wooden spoon until all the oats and nuts are coated with the liquids. Pour onto a sheet pan. Bake, stirring occasionally with a spatula, until the mixture turns a nice, even golden brown, about 25-30 minutes. 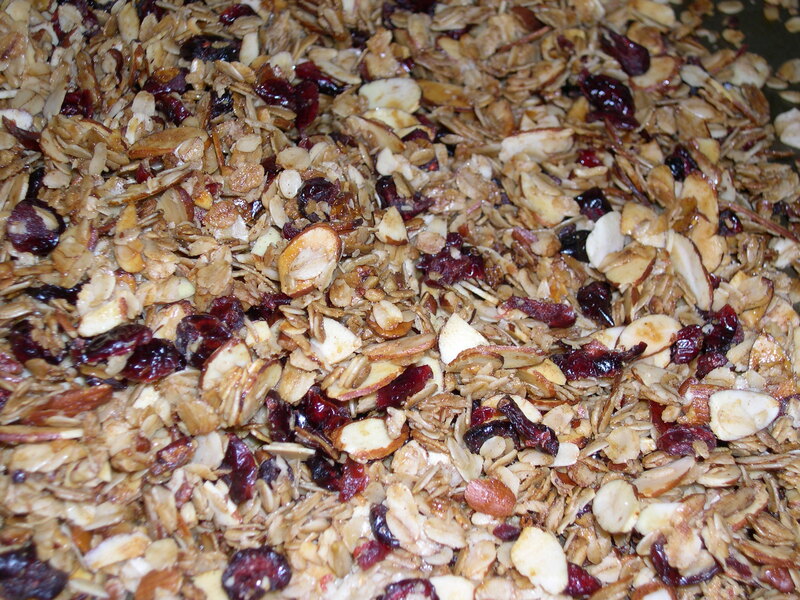 Remove granola from the oven and allow to cool, stirring occasionally. 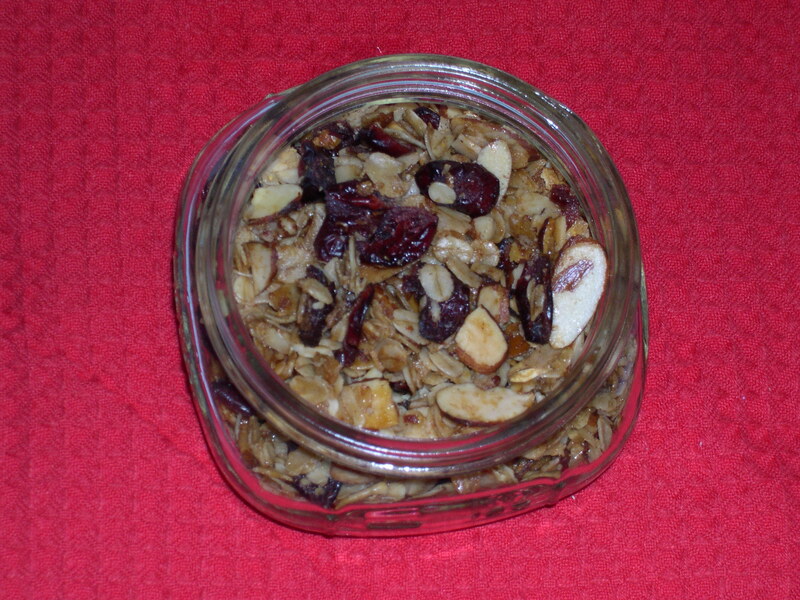 Store the cooled granola in an airtight container. Again, I changed a couple things in this recipe. I’m not a big fan of coconut so I left that out, and I had dried craisins in the house so I used those instead of the dried cherries. I didn’t have enough of the almonds to I added chopped pecans to get to the 2 cups. While the granola was baking, I set the timer for every ten minutes so I wouldn’t forget to stir it to keep it from sticking to the pan. I use the timer a lot in the the kitchen because I am usually doing something else at the same time as cooking or baking, and because I get easily distracted and forget what I was originally doing! Next I would love to design a cute label for these jars because I will definitely make these again, maybe even give them as gifts. I don’t have Illustrator yet and my drawing is still in the very beginning stages but definitely making progress. This jam recipe sounds great! Strawberries were on sale at the store for a dollar a box–up until yesterday! I really should have made some jam. What was I thinking? wow, those both look yummy! We will try both of those, for sure. We’re always looking for good granola recipes. Thanks! The granola looks good. I’m wondering …we grind our own oatmeal, do you think that would work? Everything is better with a little Grand Marnier.